Dorota was born in Lodz, Poland. She received her MSc in Molecular Biology at University of Warsaw and PhD in Biochemistry at the University of Geneva. She was a fellow at Jules Gonin Ophthalmic Institute in Lausanne and at UCSD. Recently she was appointed as an Assistant Professor at Shiley Eye Institute, UCSD. 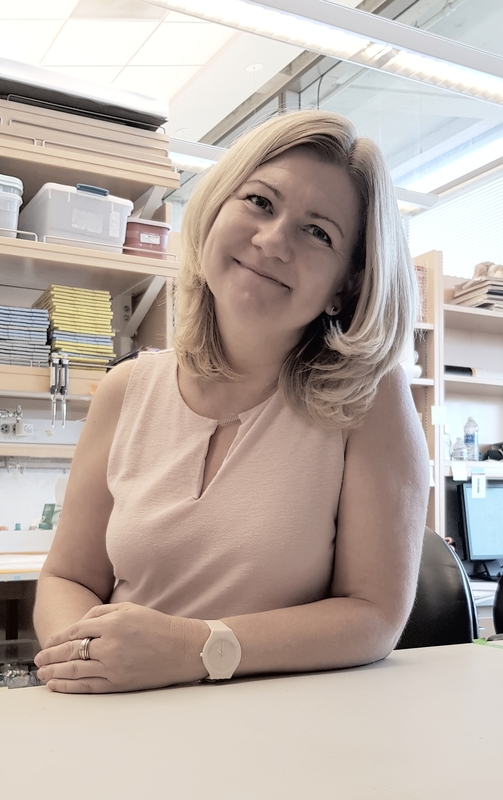 Dorota is interested in gene expression regulation, and the impact of global changes in nuclear organization on cellular programs including aging and age-related diseases. The eye is her favorite model system. Research in her laboratory is focused on understanding the transcriptomic and epigenetic changes associated with neurodegeneration and aging to describe molecular pathways underlying pathological processes in glaucoma. Dorota has a goal to make her work accessible well beyond the scientists. She would like to explain what she is doing using other means of communication, for example images. The images from the microscope are accessible only to the specialists. Art in turn can take what’s invisible to the non-artists and produce a creation making the vision available to everyone. So, as part of her aim to put the “A” into the STEM education, Dorota invited Eva into DSK lab at the University of California San Diego, and the pictures from the microscope are getting new life thanks to Eva’s skillful brush. Together they invite you to enjoy VISIONS.